Very aptly times having finished my first run over an hour since Busselton. Feeling a bit knackered, but still it didn’t go to badly. Let’s start with a confession – I have a bit of a dysfunctional relationship with running. When things are going well it’s the best, but when there’s the hint of a problem things turn nasty pretty quickly. In fact at times I fear running. 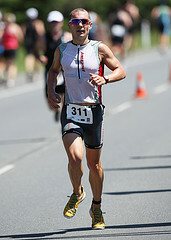 It may sound weird, of the 3 sports making up triathlon I would say running is my strength. I don’t know though, it takes me a while to feel comfortable with it. Especially after a break, getting back into it fills me with fear as twinges occur and it’s just hard work. Perhaps it’s the result of a bout of shin splints I went through last year. Not being able to run much or well was a nightmare. My strong suit was taken away and there wasn’t much I could do about it. When it eventually shifted things came back quite quickly though my end of season run stamina was lacking. So part of my fear is that once again I’ll fall victim to injury if I overdo it. At the same time I love it when I can run a lot, some of my best training periods have involved a lot of running. Anyway, the preamble over, training plans regarding running for the next few months. 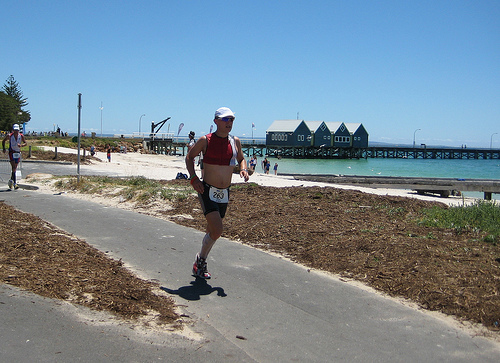 The goal is to go under 3:10 in my next Ironman, Western Australia missed that goal with a number of issues on route. I believe in WA my bike was conservative enough that I should have been able to run sub-3:10. I lost time to stomach issues and running low on energy. Both are a consequence of nutrition. The key issue for me in my next race to get the run I want is to maintain a conservative bike ride and increase carb intake during the bike and run. This is obviously something that will need some practice during training, but doesn’t directly mould the program. My run build up worked pretty well for Western Australia and much like the bike it’s a case of more of the same really. A key element is making the brick run something that always happens. No excuses, when I finish a ride I go for a run. Doesn’t matter if I’m running again later in the day or ran earlier, I run. That’s started again this week with a short 15 minute run after each bike, I’l build distance up over the next few weeks, but generally aim to be running 8-10km every time in the main period. I think there are two key benefits from this – I get used to running off the bike and I run a lot more each week (potentially 50-60km more!) The risk is obvious – more running impact is more potential for injury. The pure running side of things is pretty basic. There’s a lot of steady-state running, all comfortably aerobic. A lot of roughly Ironman pace work too, again nothing that hard really. The reality of Ironman running is it’s not that fast. One long run a week which I’ll build up to 2.5 hours in January and keep there till the race. I may put in a 3 hour run or two, but that is an area I do worry about. You really start to feel that long run when you hit 3 hours. Along with this I’ll have a couple of runs in the 40 minutes to 1 hour category again around Ironman pace. All of this work really focusses on endurance. That was definitely my main concern for my races this year, however my feeling in WA was endurance wasn’t an issue if the nutrition was backing it. I hit a low point in energy and had to take on calories. Once I was past it I was back into good running form, good cadence and was moving. The last few kilometres flew past, in fact, checking the Athlete Tracker on ironman.com and the last 0.8 miles (1.3km) was run at 5:36 mile pace (3:30 km pace)! So the endurance is there and continuing the running as I have will have me more than ready to run a marathon in Port Macquarie. A new factor in my training will be more of the trail running. So far I’ve done it once and loved it, but January should see a few more hit outs on the trails in Nerang. It’s great for overall run strength the changes in pace, the extra stability they all make you work more. All the variety keeps your mind occupied too so there’s no risk of boredom. I definitely felt a few muscles I hadn’t before after my first try. I’m hoping the extra strength workout will be handy on the hills. Other than this? Well there’s some nice hills not too far away. By nice I mean hideously steep and hurts like hell to do repeats up. I’ll be punishing myself on them in the coming months before. I didn’t need to for Busselton, but Port has hills. I’m debating a little track work. We’ll see I’m well aware that the risk of injury will go up if I go to the track. At the same time I’ve always enjoyed track sessions and it’s a route to improving speed. Ultimately I want to get the run down to 3 hours at some point that means speed work. Not committing to any track work until I feel my general run plan is going well and everything is holding together. Well that was easier to write than the bike part. That pretty much covers all my plans so for those who’ve been bored by this stuff – it’s over. For now of course, I’ll revisit it over the course of the next few months for sure. It’s easy to put stuff down in a spreadsheet. How it works out on the road is another matter entirely. One last running thought. It’s time to leave behind the tiny bit of runner’s snobbery in me that says I run as light as I can. I’ll be carrying a fuel belt on my next Ironman and my own gels. I can use what’s on the course, but I need to be managing the nutrition perfectly, not based on what I can grab as I go by.